Most window treatments offer functional benefits like privacy and light control, but there are even some that can save you money on your energy bills. Cellular shades are a great option for your home, because they can make it more energy-efficient overall. At The Blind Guy, we offer several brands of honeycomb shades, including Hunter Douglas, Alta, and Lafayette. Give us a call today to learn more about how these amazing window treatments can help keep your home cool this summer. Did you know that up to 50% of the energy used to heat and cool your home can be lost through your windows? Honeycomb shades feature small pockets that trap air and keep it from escaping through your windows. These cells insulate your windows, so the internal temperature of your home stays at a more constant level. Because your home is better insulated, your heating and cooling units won’t have to work as hard, and your home will stay more comfortable all year long. In addition, this can save you money on your energy bills. Cellular shades offer additional benefits, as well. They provide excellent light control, and you can choose from a wide variety of fabrics, including options for both room-darkening and light-filtering. Sheer fabrics are a great option for rooms in your home where you want to enjoy more natural light, because they soften the harsh sunlight that enters your home and spread it around the room for a more comfortable illumination. However, if you’re looking to outfit a bedroom or home theater, we also offer blackout options, so you can keep as much light out as possible. Privacy and convenience are other benefits offered by honeycomb shades. 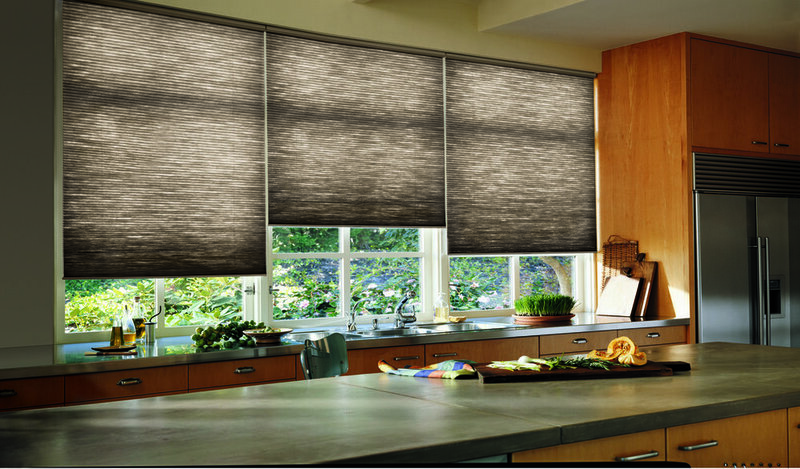 With several of our cellular shade styles, we offer motorization options, so you can control your window treatments with a remote control or your smart device. With motorized shades, you’ll no longer have to stop what you’re doing to adjust for a glare. In addition, cellular shades can help protect your privacy, because you can customize your shades in a way that lets you keep the bottom closed but open the top to let in more natural light. In addition to the many functional benefits, honeycomb shades are also stylish. They are available in large variety of fabrics, colors, and patterns, so you can create exactly the look you want in your home. Additionally, our honeycomb shades can be customized to fit specialty-shaped windows, like arches or ovals, so you can outfit any window in your home. Also, by offering free in-home consultations, we let you see exactly how our products will look in your home before you have to make any decisions. Call us today to schedule an appointment. If you’re interested in adding beautiful honeycomb shades to your home, contact the experts at The Blind Guy today. With over 17 years of experience, we have the knowledge and expertise you need to find amazing custom window treatments for your home. We proudly serve the greater Flathead area, including Whitefish, Bigfork, Kalispell, Ronan, Polson, and Eureka, Montana (MT).